The members of the popular band Backstreet Boys have recently realized that they are getting older. "We have to admit it, we are no longer boys" said band member Brian Littrell, "How long can we go on with this charade?" Another band member, Nick Carter, who recently slammed rumors of marrying his Chinese girlfriend added "She may be ten years older than me, but that doesn't necessarily mean that I am young. On the contrary, it only means that she is really old." The signs of times did not skip the rest of the band: AJ McLean, known for his drinking habits, has recently realized that using fake IDs to buy his drinks wasn't really necessary for the last fifteen years. This revelation pushed him to change his dog's name from "Jack Daniels" to "Prune Juice". Following suit, Howie Dorough announced that his nickname "Sweet D" will be changed to "Sugar Daddy"; and Kevin Richardson, who was once named People magazine's "Sexiest Pop Star" is now AARP magazine's "Most Loyal Subscriber". 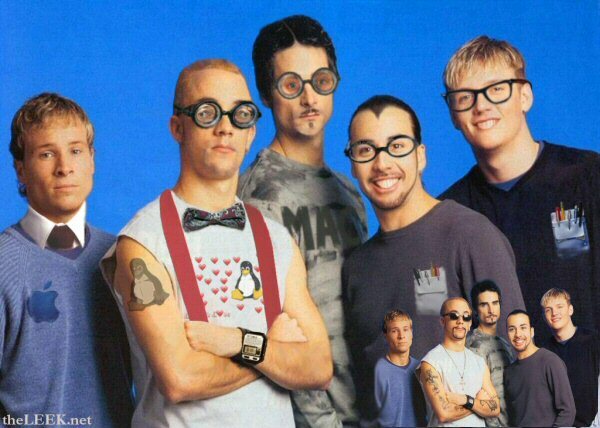 To keep current with the latest developments, the members of the band chose to delve into the world of computers and change the band name to "Information Highway Nerds". With the help of their stylists, they transformed their looks accordingly (see image below - with their original look in the corner).